Phuntso Wangye, the veteran Tibetan Communist leader, an outspoken critic of Beijing's hardline policies towards Tibet died yesterday in Beijing. "Phuntso's son, Phunkham, told Reuters "He left this morning. Before his death, he was a Communist Party member. After his death, we have invited lamas to pray (for his soul) according to traditional Tibetan culture." The Dalai Lama was probably immediately informed of the death of his former translator. Reuters recently published a fascinating piece of information. Phuntso Wangye, a veteran Tibetan Party leader would have written a series of three letters to President Hu Jintao. Wangye is not an ordinary Tibetan; in the forties, he was the first Tibetan Communist and in September 1951, he led the Chinese troops into Lhasa. In his letter Phunwang told Hu that Beijing was mistaken to believe that the Tibetan issue will be solved with the death of the present Dalai Lama: "Any notion of delaying the problem until after the 14th Dalai Lama dies a natural death is not only naive, it is also unwise and especially tactically wrong." On the contrary, he warned the Chinese leadership who read his letters that the Tibetan leader’s demise would only radicalize young Tibetan hardliners frustrated with his ‘middle way’ approach. He reminded the Chinese President about his own objective to establish a harmonious society. If he strived for the return of hundreds of thousands of exiled Tibetans, he could turn ‘confrontation into harmony’. I must admit that I did not immediately realize the importance of Mao’s point, but when I later read Phunwang’s biography, I understood better the incalculable implications of the Chairman’s statement. Phunwang recalled: “Since Mao asked this with no warning that the topic was to be discussed, the Dalai Lama just replied, "We have an army flag." I thought that was a shrewd answer because it didn't say whether Tibet had a national flag. Mao perceived that the Dalai Lama was concerned by his question and immediately told him, "That is no problem. You may keep your national flag." Mao definitely said ‘national’ flag [tib. rgyal dar]. "In the future," he said, "we can also let Xinjiang have their own flag, and Inner Mongolia, too. Would it be okay to carry the national flag of the People's Republic of China in addition to that flag? Would that be all right?" The Dalai Lama nodded his head yes. This was the most important thing that Mao told the Dalai Lama, and I was amazed to hear it. This remark had a deep impact on Phuwang who one day of April 1958 was unexpectedly arrested; he was just informed that he needed to 'cleanse his thinking'. During the following 18 years, he was interrogated, tortured and jailed in the most atrocious conditions. He was finally rehabilitated at the end of the seventies. After his rehabilitation, he continued to ponder on the isuues of nationalities within the People’s Republic of China. His personal belief was that the relationship between nationalities in a multiethnic state was supposed to be one of complete equality. He thought: “from the Marxist standpoint, the struggle of minority nationalities against oppression by the majority nationality is correct and justified because there is no equality. In the absence of true equality, ‘splittism’ is a valid response for minority nationalities.” He had himself experienced for years of ‘Great Han Chauvinism’. This had a serious corollary for Tibet and other nationalities: the State had to guarantee the equality amongst nationalities (among other things, by not imposing Han language over ‘nationality language’ such Tibetan). While many in the Party wanted to show him the door, Hu Yaobang and Deng Xiaoping instructed the officials not to remove him as a member of the Standing Committee of the National People's Congress. In a way, his stand was vindicated and in December 1982, he felt proud that the new Chinese Constitution stated: “Socialist relations of equality, unity, and mutual assistance have been established among the nationalities and will continue to be strengthened." Slowly China became less rigid and in 1984, Zhao Ziyang told the Tibetan Party leaders: "Economic development is the work priority for the nation - including Tibet. Phunwang and the Panchen Lama are both our people and we are trying to win over the Dalai Lama. Therefore, it is wrong to make them objects of political attack." Hu Yaobang, the Party boss agreed with Zhao: "Economic development is the priority of the whole nation… our country has had very hard times. If we do not pay attention to economic development in Tibet and improve the people's living conditions there, we will never achieve the kinds of political results we want." He also said that it was wrong to single out three people (the Dalai Lama, the Panchen Lama and Phunwang) and make them targets of political struggle. The debate started by Mao’s remark more than fifty years ago and reignited by Phunwang twenty years back, is still on. Will Hu Jintao and his colleagues get Phunwang’s point on the issue of nationalities or will the Great Han Chauvinism prevail once again? Perhaps the fate of the Dalai Lama’s ‘middle path’ approach and his representative’s dialogue with the United Front Department depends on which side the wind will blow in Beijing? But it is still not advisable to go around the Bakhor with a Tibetan flag: Mao’s Thought has not percolated as yet in Tibet. 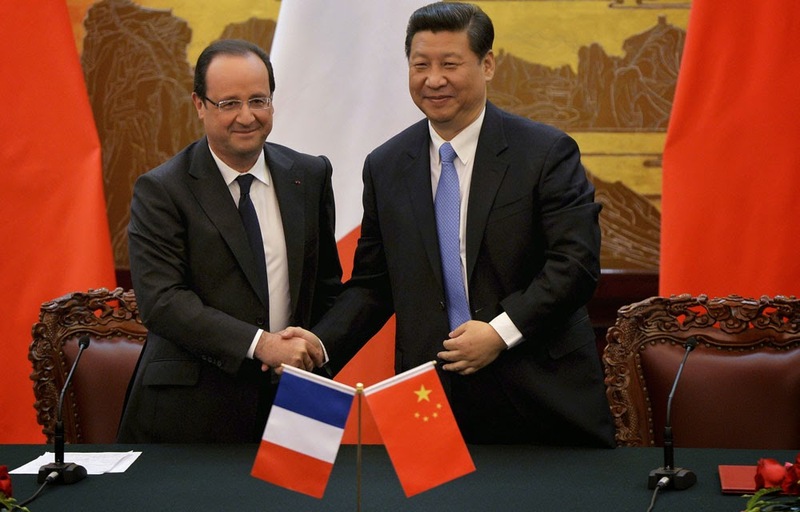 As President Xi Jinping arrives in Paris, I wonder if he will receive a reception like his predecessor, Hu Jintao got during Sarkozy's presidency. And don't say France is poor country! Giving a new life to the Yellow River? As already mentioned on this blog, on February 17, 2013, an article appeared on the website of the Yellow River Conservancy Commission of the Chinese Ministry of Water Resources. It described in detail two phaoronic projects known as the Great Western Water Diversion and the Yellow River Waterway Corridor. It mentioned a preliminary feasibility study prepared by officials of the Ministry of Water Resources. The idea of the Chinese engineers is to divert 150 billion cubic meters of water and pomp these waters in the drying Yellow River to irrigate northern China. A giant reservoir near the Yellow River 'Maqu' Great Bend would regulate the flow of the river. I am publishing here Section 3 to 6 of the article on the 'crazy' mega project. Of interest to us in India are Section 4 and 6 on the diversion of the Yarlung Tsanpo (Yaluzangbu Jiang) or Brahmaputra (Siang in Arunachal). Interestingly, Xinhua has just announced the construction of the Sichuan-Tibet grid: "Construction of power lines between Tibet and Southwest China's Sichuan province got underway." The news agency reported: "The project will cost over 6.6 billion yuan ($1.08 billion), and should be complete in the first half of 2015, solving the power shortage and transmission problems in parts of Tibet. More than 1,521 kilometers of lines will connect Qamdo [Chamdo] prefecture in Tibet and the Tibetan autonomous prefecture of Garze in Sichuan, with four substations." It further elaborated: "The project covers some very harsh terrain and work conditions are difficult with an average altitude of 3,850 meters. Shu Yinbiao, general manager of the State Grid, said that environmental protection and safe working conditions are vital to the project's success. Medical services for construction workers include 26 health centers and four hyperbaric oxygen chambers." This could be linked to a future mega-project. Here is the translation of Sections 3 to 6 of the article posted on the website of the Yellow River Conservancy Commission of the Chinese Ministry of Water Resources. The Yellow River shipping waterway, with the assistance of the "western line" water diversion project, will use the existing Yellow River riverway, and will open up navigation from the Bohai Bay to Lanzhou. The riverbed of the Yellow River will be excavated and dredged, to permit passage of 50,000-ton class vessels from the mouth of the Yellow River to Lanzhou, and with that, it will become the greatest "golden" waterway of the world. The main (note: or "trunk") shipping route of the Yellow River will be 3300 kilometers in length, from Dongying (note: a city in Shandong) at the mouth of the Yellow River into Bohai Bay, all the way to the upstream area of Lanzhou. It will pass through Shandong, Henan, Shaanxi, Shanxi, Inner Mongolia, Ningxia, and Gansu, a total of 7 provinces, providing access for 50,000-ton class ships. The shipping route along the Weihe, a tributary of the Yellow River, will extend for 388 kilometers, from Tongguan at the mouth of the Weihe, to the midstream area of Xianyang, for passage of 50,000-ton class ships. The shipping route along the Yiluohe, another tributary, will extend 50 kilometers, from the mouth of the Yiluohe to Luoyang, for passage of 50,000-ton class ships. The shipping route along the Fenhe, yet another tributary, will extend 600 kilometers, from Hejin at the mouth of the Fenhe, to the upstream area of Taiyuan, for passage of 50,000-ton class ships. The Datong shipping route, from the Qingshui River, to Datong, and on to Tongzhou, will extend for 1000 kilometers, from the upper reaches of the Qingshui River, in the middle of the Yellow River, along the Sanggan River, through the Guanting water reservoir, to Tongzhou District in Beijing. It will pass through Datong, and connect to the northern stretch of the Beijing-Hangzhou Grand Canal in Tongzhou, allowing passage of 1000-ton class vessels. On the lower reaches of the Yellow River, the Weihe and Majiahe secondary shipping routes on the North bank, as well as the Jialuhe and Huijihe secondary shipping routes on the South bank, will all connect to the Beijing-Hangzhou Grand Canal, for passage of 1000-ton class vessels. The Beijing-Hangzhou Canal is 1700 kilometers in length, and can carry 10,000-ton class vessels. At its Northern reaches, it permits passage through Tianjin and into the Bohai Bay, whereas at its Southern end, it reaches Hangzhou, and permits passage out into the East Sea. As such, the entire marine shipping network will on one hand reach up to the Bohai, on the other down to the East Sea, and going inwards, all the way to the heart of the West, forming a super-network which will encompass half the country. The ‘western line’ water diversion project, will draw 150 billion cubic meters of water from 6 rivers: the Yaluzangbu Jiang, the Nu Jiang, the Lancang Jiang, the Jinsha Jiang, the Yalong Jiang, and the Dadu He. The water will be sent to the Maqu Daguaiwan super-reservoir on the upper stretches of the Yellow River. Out of that water, 50 billion cubic meters will pass through man-made canals, sending 10 billion cubic meters to Qaidam Basin in Qinghai Province, 30 billion cubic meters to the Taklimakan Desert in Tarim Basin in Xinjiang Province, and 10 billion cubic meters to Lop Nur. The remaining 100 billion cubic meters will flow out along with the existing waterflow of the Yellow River, allowing many hydropower stations serving Lanzhou to operate at full capacity, as well as providing 50 billion cubic meters for diversion along the river branch at Qilihe District of Lanzhou. Those 50 billion will be carried by man-made canals, through the Hexi Corridor, sending 10 billion cubic meters to the Turpan Basin in Xinjiang, another 10 billion to the Junggar Basin, and 30 billion to boost the laggard waterflow of the Shiyang He, Hei He, and other rivers. The balance of 50 billion cubic meters will flow through the Yellow River to the ocean, boosting the river's water level to permit navigation. The construction can be divided into 2 phases: phase 1 will include tributary river projects, discharge waterway projects, tributary shipping waterway projects, shipping canal projects, and water-supply canal projects; phase 2 will include the main/trunk shipping waterway project, water locks, reservoir, widening of the Beijing-Hangzhou canal, and water-supply canals into the Northwest. Tributary projects: These projects will start from the highest class of tributary rivers. First, simple, temporary dams will be built to shut off the entrances of the level-3 tributaries and their large and small gullies (note: or "ditches"), and they will be drained of water. Then, the riverbed will be dredged, and the slopes on either side of the river will be leveled (note: or "graded"?). Since gentle slopes are advantageous for preventing soil erosion, a 15-degree slope is best. Then, simple, temporary dams will be constructed on the level-2 tributaries and their large and small gullies, and the same procedure as above will be followed. Last will be the level-1 tributaries and their large and small gullies, with the same procedure again. As these projects progress to the lower-class tributaries, the amount of water to be drained will be larger and larger, so if it proves necessary, low-lying land can be found for excavation of temporary drainage reservoirs, or the water can be discharged through canals into other rivers. Discharge Waterway projects: The Weihe and Majiahe, on the North bank of the lower reaches of the Yellow River, will be blocked off with temporary dams. Then the base of the trapezoidal cross-section of their entire riverbeds will be widened to a minimum of 100 meters, with a minimum depth of 9 meters, a normal water level of 6 meters, 15-degree slopes on each side, and an average downhill slope of 0.04% or less. The Jialuhe, Huijihe, and other similar tributaries on the South Bank will be dealt with in exactly the same way. The discharge channels on the north bank will be situated at the mouth of the Fenhe, and will flow through man-made channels to the Weihe, Majiahe, etc. The discharge channels on the south bank will be situated at the mouth of the Qinhe, and will flow into the Jialuhe, Huijihe, etc. The trapezoidal cross-section of the discharge channels will be 150 meters wide at the base, at least 9 meters in depth, with a normal water level of 6 meters, a 15-20 degree slope on either side, and an average downhill slope of 0.04% or less. The discharge channel for the Weihe (NOTE: this is *different* from the Weihe mentioned in the previous paragraph. The 2 names are written with different characters.) can make use of the existing Luohe; man-made channels will conduct water from the mouth of the Weihe to the middle reaches of the Luohe, and further down, other man-made channels will connect the Luohe to the discharge channels on the south bank. The trapezoidal cross-section of these channels will be 20 meters wide at the base, at least 9 meters in depth, with a normal water level of 6 meters, and a 40 degree slope on either side. There is no need to pay special attention to the downhill slope. The discharge channel in the upriver area of Lanzhou will conduct water through Lanzhou, along the West side of the Yellow River, through Jingtai County, and into the Hexi Corridor. At Wuwei it will flow into the Shiyanghe. This channel will help in transporting water through the Hexi Corridor to Xinjiang. Shipping Canal projects: Upstream from the temporary dams at the mouths of the Wei and Yiluo rivers, a large dam with water locks will be constructed, whereas upstream from Xianyang and Luoyang, "bottom-stretching" (or "bottom-reaching"? The name seems to indicate either that the dams extend up from the riverbed, which seems trivially true of any dam, or they extend deeper down into the riverbed.) water control dams will be constructed. The trapezoidal cross-section of the river bottom will be at least 400 meters at the base, with a depth of no less than 18 meters, a normal water level of 15 meters, and a slope of 20-25 degrees at the sides, as well as an average downhill slope of 0.04% or less. The trapezoidal cross-sections of other tributary rivers will be decided based on whether, whether they will be opened for shipping, and if so, what the class of ships sailing on them will be. Canal projects: The canal from the Qingshui river, through Datong, and on to Tongzhou will have a dam with water locks at the entrance of the Qingshui. Another dam with water locks will be located at the exit of the Guanting water reservoir. The trapezoidal cross-section and slope will be the same as the discharge channels on the North and South sides of the lower stretches of the Yellow River. Water-use Channel projects: (note: perhaps this refers to channels used for transporting water for irrigation? The name seems to indicate the water is for human use, not simply for shipping.) The discharge channel upstream from Lanzhou, also known as the Northwest Channel. It will have a branch which will be a water-use channel, stretching from Jingtai, along the Yellow River on its Northwest side, to Hohhot. After the phase 1 projects are completed, the temporary dams for the Weihe, Majiahe, Jialuhe, and Huijihe, as well as other discharge channels, will be dismantled. All the temporary dams constructed at the mouths of level-1 tributaries will remain. The discharge channel on the upstream side of Lanzhou will be opened up. At the exit of the Northwest Channel, near Lanzhou, a temporary dam will be built on the side toward the downstream side of the Yellow River. The portion of the channel cut off by the dam will be drained. 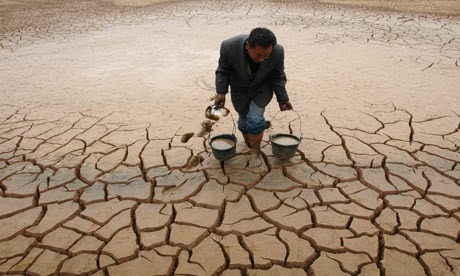 The water can be used locally, or if it is too much, it can be diverted into the desert and used for irrigation. Dry-river projects: At the mouth of the Yellow River, going out into the sea, a temporary dam will be built. On the downstream side of the temporary dam at Lanzhou, a "bottom-stretching" water control dam will be built. The trapezoidal cross-section of the dry river bed will be at least 500 meters at the base, with a maximum depth of no less than 18 meters, normal water level of 15 meters, sides with slope of 20-25 degrees, and downhill slope same as the shipping channels. In the canyons of the upper and middle stretches of the Yellow River, the natural features of the terrain and its green cover can be maintained, but the depth and width of the channel must be enough to permit navigation. The entrance of the Weihe water-supply channel is directly across (note: or "facing") the exit of the Lanzhou Northwest Channel. Water-locks projects: Three "bottom-stretching" dams with water locks will be constructed on the dry riverbed at Heishanxia (Black Mountain Gorge), Tuoketuo, and Yumenkou. They will divide the drained riverbed into 4 sections, from Lanzhou-Heishanxia, Heishanxia-Tuoketuo, Tuoketuo-Yumenkou, and Yumenkou-Dongying. All three dams will have multiple locks, including one pair for 50,000-ton class ships, one pair for 20,000-ton class ships, one pair for 10,000-ton class ships, two pairs for 5000-ton class ships, and two pairs for 1000-ton class ships. The chamber inside the 50,000-ton class locks will have effective measurements of 300 by 50 by 12 (note: meters?). The width of the water-lock dams will be about 800 meters, with a depth of about 1500 meters. Water reservoir projects: At the Maqu Great River Turn area, there will be a water reservoir with a capacity of 150 billion cubic meters. On the inner side of the Great River Turn area dikes will be built, and will connect with the mountains surrounding the area to form a vast reservoir 30 kilometers wide, 90 kilometers long, and 60 meters deep. The cofferdam dikes built around the reservoir will be trapezoidal in cross-section, with a 45 degree incline on the inner side, and a 30 degree incline on the outer side, running for a total length of 240 kilometers, at least 184 meters thick at the base, 60 meters tall, and at least 20 meters thick at the peak. The reservoir outlet will be on the downstream side of the Maqu Great River Turn area. The dikes will be constructed using gabions, with geo-membrane on the inner side, and filled with earth dug up on site. Widening of the Beijing-Hangzhou Canal project: When the elevated riverbed of the Yellow River comes down to ground level (note: due to many years of silting, the last ~800km of the Yellow River is elevated above ground level and is kept on its course and prevented from overflowing by dikes), and connects with the Beijing-Hangzhou canal, the original capacity of the canal to carry vessels up to 1000 tons will make for a severe mismatch with the 50,000 ton vessel capacity of the Yellow River. Therefore, the capacity of the canal can be increased to carry 10,000 ton vessels, and the elevated portion of the canal in Shandong can be lowered to the same elevation as the connections with the Yellow and Yangze rivers. As the entire course is made flat and level, it will also be deepened and widened. The trapezoidal cross-section of the canal will be at least 300 meters at the base, at least 15 meters deep, with a normal water level of 12 meters, and a 20-25 degree slope on the sides. The average downhill slope of the canal will be decided by the relative elevation of the Yellow River and Yangze River riverbeds. If the slope is excessive, then the construction of water locks must be considered. At the point where the Yellow River (primary shipping channel) exits to the sea at Dongying, the bottom will be dredged to a depth of at least 25 meters. In the gulf port at the mouth of the Yellow River, the depth to which the mooring berths will be dredged will be decided according to the depth which the ships require. After the phase 2 projects complete, all the tributary and dry riverbed temporary dams will be dismantled. The water-use channels and bypass channels running along the Weihe and Yiluohe will be taken out of commission, but can be left in place in case they are useful in the future. The discharge channels on the North and South sides of the lower reaches of the Yellow River will be kept and will serve as secondary river channels. The primary river channel on the lower end of the Yellow River will become its primary shipping channel, and the secondary river channels will become secondary shipping channels. The primary and secondary Yellow River shipping channels, along with the Qingshui-Datong-Tongzhou canal and the Beijing-Hangzhou canals will all connect for passage of shipping traffic, and will form the main framework (note: literally "skeleton"; perhaps translate as "backbone"?) of the new marine shipping network. The discharge channels chosen for use during the Yellow River shipping channel project, are all preexisting riverways, which will greatly reduce the work to be done and the amount of movement required. The discharge channels used on the upper stretches of the Yellow River, however, do include some man-made channels for diversion of water to the Hexi Corridor. These discharge channels will not require too much work, will not occupy too much space, and will not require many people to be relocated. Since the average downhill slope of the Yellow River riverbed is as high as 0.46%, the limited water volume available cannot maintain the required depth when descending such a steep slope. If we were to limit the average slope to no more than 0.06%, the height of each big dam with water-locks would have to be extended as high as 400 meters, or more. If that was the case, the work required to build each dam, and the technical difficulty involved, as well as the work involved in building dikes on either side of the riverway, would be greatly increased. The enormous dams and dikes, protruding hundreds of meters from the ground, would form huge barriers, as well as being a safety hazard. While our plan does involve a certain degree of height to the dams, we solve the problem primarily by making the base of the dams extend down below ground level, thus increasing the difference between water level behind and in front of the dam, and making it possible to flatten out the slope of the riverbed. The height of those huge 400-meter dams will mostly be *below* ground level, greatly mitigating the safety hazard, and reducing the technical difficulty of construction. This way, the above-ground height of both dams and dikes can be kept within reasonable limits. 150 billion cubic meters of water are to be drawn from the Yaluzangbu Jiang, the Nu Jiang, the Lancang Jiang, the Jinsha Jiang, the Yalong Jiang, and the Dadu Jiang, and be diverted to the upper Yellow River. Of that amount, 50 billion cubic meters will be taken from the Yaluzangbu Jiang, approximately 30% of its yearly flow of 165.4 billion cubic meters; the Nu Jiang will contribute 24 billion cubic meters, roughly 35% of its yearly flow of 74 billion cubic meters; from the Lancang Jiang, 26 billion cubic meters, roughly 35% of its yearly flow of 74 billion cubic meters; from the Jinsha Jiang, 28 billion cubic meters, roughly 20% of its yearly flow of 143 billion cubic meters; from the Yalong Jiang, 12 billion cubic meters, roughly 20% of its yearly flow of 60.4 billion cubic meters; and from the Dadu Jiang, 10 billion cubic meters, roughly 20% of its yearly flow of 50 billion cubic meters. The water outlet on the Yaluzangbu will be the point where the level-2 tributaries Palongzangbu and Yigongzangbu flow into the (level-1 tributary) Layue He. 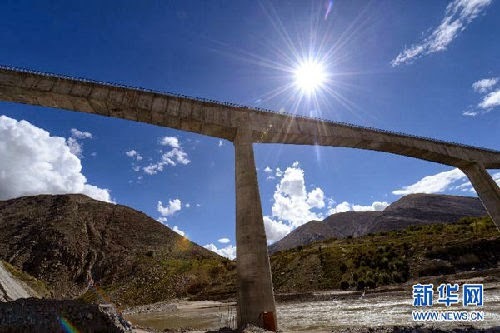 The diverted water will flow east along the Sichuan-Tibet Highway, from Mibo to Bashe, and will join the channel for water diverted from the Nu Jiang. The merged channel will contain flowing along the Sichuan-Tibet Highway, from Xiaya to Changdu, and will merge with the channel carrying diverted water from the Lancang Jiang. The channel, now carrying water from 3 rivers, will continue along the highway, from Jiangda to Dege, and will then merge with the channel carrying water from the Jinsha Jiang. The merged channel will will continue along the highway, past Que'er Mountain, through Manigange to Ganmu, and will then merge with the channel carrying water from the Yalong Jiang. Now carrying water from 5 rivers, the merged channel will continue along the same highway, through Huhuo, to Lianghekou, on the Dajin Chuan, a tributary of the Dadu He. There, it will merge with the water diverted from the Dadu He, and will turn North, flowing along the Aba Highway, through Rangtang and Aba. It will continue flowing to the upper Yellow River, and will cross over the Yellow River and flow into the Maqu Daguaiwan reservoir. Previous proposals for the Western Line water diversion project, have generally recommended using natural (downhill) water flow to transport the water, so as to reduce the operating costs of water diversion. However, this would make the technical difficulty of the project very great. It would mean building highly elevated reservoirs, and excavating long, deep tunnels for the water to flow through. If we take a different perspective, and abandon the idea of natural water flow, instead using external electric power to pump the water, that extreme technical difficulty can be avoided, though the operating costs will of course be much greater. If we can bear those operating costs, then the plan described above is feasible. The difference between the Great Tongdao water project and most other water projects, is that the economic and social benefits to be reaped are far better. Most water projects take a long time to recoup the construction costs, or even never recoup them at all. In contrast, the Great Tongdao project has enormous meaning; in effect, it can turn Henan province, Shanxi province, Shaanxi province, Inner Mongolia, Ningxia province, Gansu province, and Anhui province into "coastal" provinces. At the same time, it will make Qinghai, Xinjiang, and Tibet take a giant step towards parity with central China, as if the "golden coastline" of Southeast China was extended all the way into the belly of the deep West. So the Datongdao project can pay back all the capital expenses of the entire project, it can compensate for all the damages caused, and it can pay for the high operating expenses of electric pumping. Therefore, there is no reason why this project cannot proceed by use of electric pumping for water transport, thus easily avoiding the difficulty of building elevated reservoirs and deep, long-distance tunnels. Besides, the enormous power generation capacity which the Yaluzangbu Daguaiwan power station will provide, will do much to relieve the strain on the existing power network. If electric pumping is used all along the entire water diversion course, then when choosing the route to be taken, there is no need to worry about altitude and levelness, so a route which takes the pipes along a public highway will be simplest and most convenient for construction. The volume of the reservoirs and channels for diverted water will not be an issue for water delivery, so construction of reservoirs at the water inlets and outlets will not be required. In the high mountains and deep valleys of the Southwest, there will be no need to build dams or dig long, deep tunnels, and the need to build roads for transporting construction supplies into remote areas will be greatly alleviated. Basically, all the tricky technical parts of the Datongdao and Western Line projects will disappear. With no high-altitude reservoirs, no deep tunnels, and pipes and channels running along public highways, the quantity, difficulty, and expense of construction work will be slashed. The investment capital required to set up water pipes and channels, and the high operating expenses of pumping the water, can all be carried by the enormous economic and social dividends provided by marine shipping. The electric power generated will be seasonal, which is disadvantageous for any other use; but for water diversion, it's perfect. When the rivers are high, the hydroelectric power stations will produce at full capacity, just when the pumps for water diversion need the most power. When the rivers are at moderate level, the hydroelectric stations will generate a moderate amount of power, and the power consumption of the pumps will also be moderate. When the rivers are low, water will not be diverted. Any hydroelectric power generated during the low season, as well as any excess power during the high season, will be given to Tibet. The great canyon of the Yaluzangbu Jiang forms a "U" shape toward the Northeast. The water reservoir which is to be built on the Yaluzangbu will be toward the end of one branch of the "U", at Paiqu town. That part of the canyon has yearly water flow of 68 billion cubic meters. The dam will be 50 meters high, and will pass 40 billion cubic meters through the generator turbines each year. The generator station itself will be located close to the other branch of the "U", will have a capacity of 35,000 megawatts, and will connect to the reservoir through a sloped tunnel 30 meters in diameter and several kilometers long. The top and bottom of the tunnel will have a 2.2 kilometer difference in elevation, and will pass enough water to generate 150 million megawatt-hours per year. The power used for pumping the diverted water could be brought in from elsewhere, or could be transmitted from the Yaluzangbu power station. Ideally, the power generated from the diverted rivers would be used to cover the power needs of the whole diversion project, though this would increase the required investment and difficulty of construction. Even if it is deemed necessary to buy power from elsewhere, the economic benefits of the Datongdao project are still enough to pay for its operating expenses. Of course, if building the new power stations proves too difficult to do right away, the project could initially run on purchased electricity, and when the time is right, the Yabuzanglu power station could be built. Or, if China's level of engineering and construction expertise advances in the future, maybe converting the water diversion channels over to use natural water flow rather than pumps would become feasible. Some excerpts of the Henderson-Brooks/Bhagat Report on the 1962 Sino-Indian War. The Report speaks of Five Fundamental Errors. These sections deal only with the NEFA operations. 149 The unbalanced posture of our forces in the KAMENG Sector [of NEFA, today Tawang and West Kameng’s district] on the eve of the Chinese offensive needs NO elaboration. TOWANG [Tawang], which should have been the main centre of strength, lacked troops; the bulk having been inveigled to a flank in the NAMKA CHU Valley, without adequate logistic support and in tactically unsound positions. That we continued to oblige the Chinese in this unbalanced posture till they struck was as grave an error as the initial sending of 7 Infantry Brigade into the Valley. These two can be combined and categorized as ‘FUNDAMENTAL ERROR NO 1’. The responsibility for this lies with the Corps Commander [Lt. Gen. B.M. Kaul], though both Army Commander [Lt. Gen. L.P. Sen] and the General Staff Army Headquarters could easily also have changed it, had they been more decisive. 150 The rout of 7 Infantry Brigade was a foregone conclusion, but, in its wake, it started the snow-ball of defeat, which was to stop a month later and that also at the instance of the Chinese. 151 It is clear that much of this would have been averted had a clean break been made at TOWANG and the withdrawal to BOMDILA had been carried out as planned. The holding of SELA [pass] was accepted by the Army Commander [Sen], presumably, at the dictates of the General Staff at Army Headquarters [in Delhi]. That SELA was a strong natural tactical position there is NO doubt, but it required both extra troops and logistic support to hold it. Neither of these were planned or provided for by the General Staff or Eastern Command [in Lucknow]. Instead the lull between the two Chinese offensives brought about a sense of complacency and IV Corps were given troops haphazardly and in fits and starts. Little provision was made for adequate logistic support. 152 It is agreed that the NEFA battles were the concern of the [IV] Corps. It must, however, be made clear that this applied to only the tactical sphere. The overall defensive planning and the provision of logistic support must and always should be the concern of the Command [in Lucknow, General Sen] and the General Staff at Army Headquarters [in Delhi]. Unfortunately, the reverse happened. There was interference in the tactical level and the overall planning and provision of logistic support was conspicuous by its absence. The decision for holding SELA [pass] and the lack of overall planning and providing of logistic support can be grouped together as “FUNDAMENTAL ERROR No 2”. The responsibility for this lies jointly with General Staff Army Headquarters and Eastern Command. 153 The dispersal of forces in penny-packets, the complacency shown in the allotting of defence sectors to brigades, and the lack of urgency in developing defenses during the lull period was “FUNDAMENTAL ERROR No 3”. For this the major responsibility was that of the Division [4 Infantry Division]. It also partly reflects on the poor leadership of the [IV] Corps [Kaul] who could have stopped the dispersal and energized the preparation of defences. 154 The pendulum swung the other way, once the second Chinese offensive started. There was frenzied reaction to the Chinese approach to BOMDILA [between Sela pass and the foothills] from the NORTH. A battalion was hurriedly ordered up from the main defenses of BOMDILA with inadequate ammunition and fire support, and rushed to THEMBANG to meet the enemy half-way. In the first instance, the sending of this battalion to fight it out by itself in hurriedly prepared defences against a regiment or more was a mistake. Besides, even if the battalion had to be sent, this should have been planned and organized earlier. Inspite of these handicaps the Battalion fought well till its ammunition was spent. That it had to withdraw and then get disintegrated is neither the fault of the Battalion nor of the Brigade. The loss of this Battalion, 5 GUARDS, lies squarely on the  Division. 155 On the fall of THEMBANG and the possibility of the Road BOMDILA – DIRANG DZONG being cut and DIRANG DZONG itself being infested brought about a complete frenzy in Divisional Headquarters. Troops from Brigades were rushed for the protection of Divisional Headquarters. Withdrawals were planned and stories concocted to make the withdrawal case stronger. Indeed it reached the pitch when 62 Infantry Brigade was led to believe it was in danger. A withdrawal on it was forced so that Divisional Headquarters could withdraw. 156 NOT content with that the Division committed the Brigade to withdraw within a matter of hours on night 17/18 November the battalion holding KAILA Pass. This was the turning point in the Fall of SELA. The withdrawal of this battalion led to the panic in 1 SIKH and the abandonment of SELA and eventual disintegration of 62 Infantry Brigade. 157 The last role of the Divisional Headquarters was its flight. A strong force of all arms of over 2500 vanished within a matter of minutes. This was NOT the fault of the troops nor of the units but of the lack of centralized leadership and control in the face of the enemy. A coordinated force of that size had more than even chance of getting to BOMDILA. Efforts of a few officers, particularly those of Capt N.N. RAWAT, could NOT, however, replace disintegration of command. 158 All the above Divisional reactions can be grouped under “FUNDAMENTAL ERROR No 4”, and was fairly and squarely due to the acts and omissions of Headquarters 4 Infantry Division. 159 The Division dissolved and the last of its brigades was next to be broken up by Corps or more accurately, by a ‘Triumvirate’ comprised of the Army Commander [Sen], the Corps Commander [Kaul], and the Director of Military Operations [Maj. Gen. D.K. Palit]. Ignorant of the tactical layout, out of touch with the situation in BOMDILA, they planned an ordered the moving out of a sizeable force from the already bare BOMDILA defences. NOT that they were NOT warned, and ‘irrespective of what happed to BOMDILA’ they ordered a force to open the Road BOMDILA – DIRANG DZONG. For what purpose and for whom on the morning of 18 November is NOT clear. 160 The ordering out of the force was directly responsible for the fall of BOMDILA. There were four companies left in the BOMDILA defences. Indeed, on the flank where the Chinese attacked, there was one platoon, where there should have been a battalion. This then was “FUNDAMENTAL ERROR No5” and it sealed the fate of BOMDILA. The planners and orderers must take the blame for this. 161 BOMDILA fall. It was now the Corps Commander’s turned to give orders and counter-orders as to where the Chinese should be held. It was first BOMDILA, then right back to FOOT HILLS, then forward to RUPA, and, finally midway to CHAKU. To blame the hapless Brigade Commander of NOT being able to restore the situation is to find a scapegoat. Under the circumstances, the resistance that was offered and that the Brigade remained a fighting force, despite these orders and counter-orders- some direct to units – was due to the Brigade Commander keeping his head and striving till the last to organize what little force he had. 162 Thus ends the story of the famous ‘Fighting Fourth’ [Brigade]. 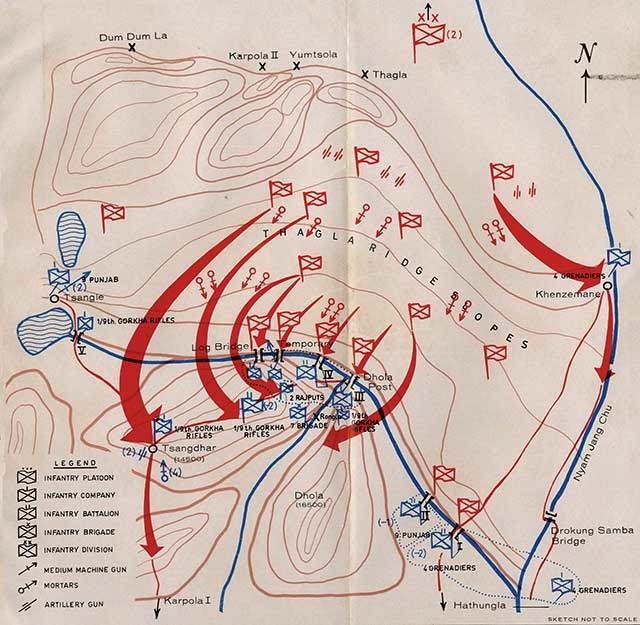 In the end all that could be mustered for the last fight were six weak infantry companies out of a total force of sixteen battalions and countless other troops of the supporting arms and services. It was probably in late 1963. A senior Indian Army officer, just released from a PoW camp in Tibet where he had spent 7 months in dreadful conditions, went to Grindlays Bank on Connaught Place in the Indian capital. As he entered the bank, he saw a familiar figure at one of the counters. He had served under this person before being taking prisoner to Tibet by the People’s Liberation Army. 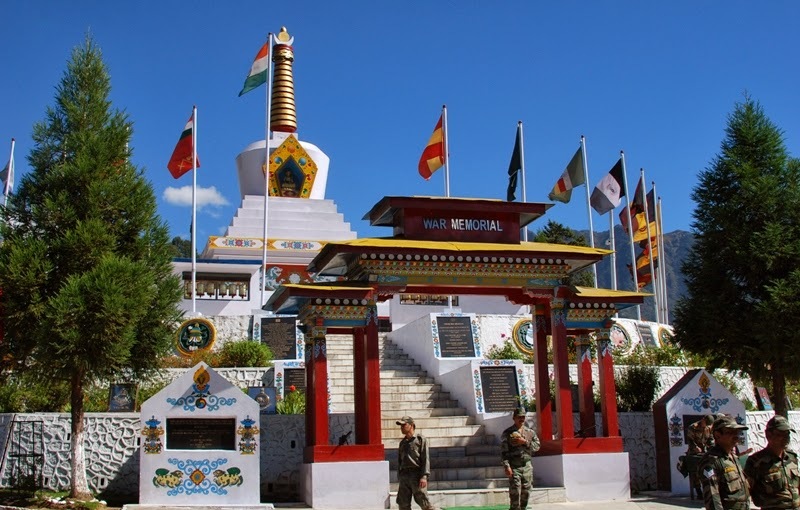 The officer was one of the hundreds of ill-fated jawans and officers caught by the Chinese at the front, near the Namkha Chu (river) in Tawang sector of West Kameng Frontier Division (today Tawang district of Arunachal Pradesh). Hundreds of others were even less lucky; they never returned from West Kameng. The ‘person’ was Lt. Gen. B.M. Kaul, Nehru’s blue-eyed boy, the Commander of the 4 Corps. For many, he was the chief villain of the 1962 debacle against Mao’s troops. The officer who greeted him had served under Kaul in the 4 Infantry Division (of 4 Corps). This story came back to my mind when I read the now ‘declassified’ report of the 1962 war prepared by Lt. Gen. Henderson-Brooks and Brig. Prem Bhagat. General Kaul, who was Chief of General Staff (CGS) in the Army Headquarters, before taking the command of the 4 Corps, is one of the main persons indicted by the Henderson-Brooks Inquiry Commission, as we shall see on the excerpts published below. But Nehru, who had promoted Kaul to positions that the general was unable to assume, was the real guilty man. His name is not mentioned in the Henderson-Brooks report, as the terms of reference of the Commission were limited to military operations. I am posting here the ‘conclusions’ of the operations in the Western Sector (Ladakh) and the lack of preparedness of the Indian Army. The ‘Headquarters’ [meaning, Nehru, Krishna Menon (Defence Minister), Gen Thapar (Army Chief) and Kaul, amongst others] had tried to bite more than they could swallow. Time and again, the myth that ‘the Chinese will not attack’ was reiterated. The intelligence agencies (under B.M Mullick) are definitively to blame. The 'Chinese will not attack' mantra was still being recited on the morning of October 20, 1962, when thousands of Chinese descended the slopes of Thagla ridge and surrounded the Indian troops. On the title page of the Top Secret Report, Henderson-Brooks quote the Chinese tactician Sun Tzu: “Know yourself, know your enemy: a hundred battles, a hundred victories”. Does India know China today? Probably not. My comments are in ; the underlining is mine. Reading this, one understands why Lt General Kaul was crying in the Bank in Delhi. 1. This Review of Western Command was undertaken as the ‘Forward Policy’ was primarily introduced to baulk the Chinese claims in LADAKH. Had the developments stemming out of it been correctly apprised by the General Staff [Lt. Gen/ B.M. Kaul] at Army Headquarters and correlated to NEFA [North East Frontier Agency]; it is possible that we would NOT have precipitated matters till we were better prepared in both theatres. 2. As it was, we acted on a militarily unsound basis of not relying on our own strength but rather on believed lack of reaction from the Chinese. We forgot the age old dictum of the ‘Art of War’ summed up so aptly by Field Marshal. Lord ROBERTS. “The art of war teaches us to rely not on the Likelihood of the enemy NOT coming, but on our own readiness to receive him; not on the chance of his not attacking, but rather on the fact that we have made our position unassailable”. 3. Militarily, it is unthinkable that the General Staff did not advise the Government on our weakness and inability to implement the ‘Forward Policy’. 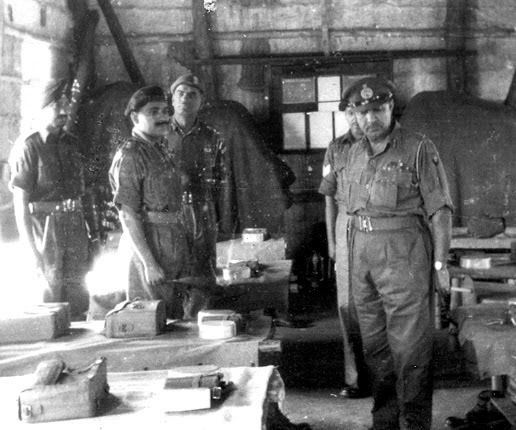 General Kaul in his report (Appendix paras 65-69) has brought out that, on a number of occasions in 1961-62, the Government were advised of our deficiencies in equipment, manpower, and logistic support, which would seriously prejudice our position in the event of a Chinese attack on us. The fact, however, remains that orders were given by the General Staff in December 1961 for the implementation of the ‘Forward Policy’ without the prerequisite of ‘Major Bases’ for restoring a military situation, as laid down by Government. Indeed General KAUL as CGS and the DMO [Directorate of Military Operations], time and again, ordered in furtherance of the ‘Forward Policy’ the establishment of individual posts, overruling protests made by Western Command. 4. There have been pressure put on by the Defence Ministry [V.K. Krishna Menon and probably Nehru], but it was the duty of the General Staff to have pointed out the unsoundness of the ‘Forward Policy’ without the means to implement it. ‘This was brought out very forcibly by GOC-in-C [Army Commander] Western Command in his letter of 17 August 1962 (Annexure 21). Apparently, however, the General Staff at No stage submitted to the Government an appraisal on the consequences of the ‘Forward Policy’ or the basic requirement of troops and resources required before it should have been implemented. 5. General KAUL in his report goes on to state that in a number of meetings held by the Defence Minister and attended by COAS [Chief of Army Staff. General P.N. Thapar], himself as CGS, DIB [Director Intelligence Burreau, B.N. Mullick] and representatives of Defence, External affairs, and Home Ministries, the general view was that the Chinese would not provoke a show-down. (Appendix para 70). This is strange, because military action emerges from both political and military appreciations. 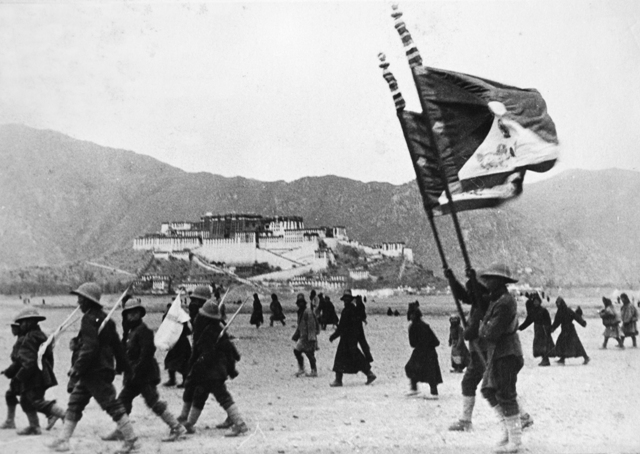 It was clear from 1960 onwards that CHINA had greatly increased her forces in TIBET. A strength far greater than that required for defence of quelling of Tibetan uprising. This was brought out in October 1960 in the Military intelligence Review 1959-1960. 6. To base military actions and place in jeopardy the security of troops on suppositions and beliefs put across at conference tables indicates either acceptance of the belief or a militarily immature mind. The General Staff, particularly the CGS, Deputy CGS, and the DMO went a step further and permeated this belief into the Army, with the disastrous result that even field formations were infected with a sense of complacency. This stemmed from the fact that after 1960 planning and detailed staff work be essential for ‘Higher Direction of War’ was never seriously undertaken [that is the tragedy]. 7. Where there are so many intangibles, as in war, it is essential that all facets of a problem are thoroughly examined before a course of action is determined. The higher the level the greater the necessity for a thorough examination. This process of higher levels must be carried out in writing as the wide range of examination cannot obviously be covered mentally or verbally. Thus, in modern times, staff has increased as the complexities of war increased, and a system of staff duties have evolved which ensures a thorough appraisal and systematic planning before a course of action is adopted. 8. The detailed staff work that was carried out before the NORMANDY Operations is common knowledge. Our staff at Army Headquarters is patterned on the War Office in the UNITED KINGDOM. Our General Staff with its Operations, Intelligence, and Staff Duties Directorates is designed for such detailed staff work. (a) The Chinese build up in TIBET by end of 1960 had substantially increased and was brought out in the Military Intelligence Review 1959-60. This required a fresh reappraisal of our forces and tasks. (b) The introduction of the ‘Forward Policy’ end of 1961. Before its introduction it was essential that an appreciation should have been prepared bringing out the requirements of troops and resources and also possible Chinese reactions. (c) The incidents in August/September 1962 including the surrounding of the Galwan Post in Ladakh and the Dhola in NEFA showed clearly the mounting tension and a possibility of an armed clash. Western Command had brought out in August 1962 in no uncertain manner the dangerous situation that had developed. This again required a fresh appraisal for the steps to e taken to meet the overall situation. (d) At the outbreak of hostilities if a coordinated plan had been made to meet the Chinese offensive our troops would perhaps have been more balanced and there would NOT have been any question of plugging holes at the last moment. 10- It is apparent that none of this planning took place and NO operation orders or instructions were issued by the General Staff. It was therefore NOT possible for Command or lower formations to issue any comprehensive order without a directive from the General Staff. All that could be done by Western Command to meet the situation, when the hostilities broke out, was done. Troops and equipment were depleted from formations facing Pakistan to reinforce Ladakh. 11- This lapse in Staff Duties on the part of the Chief of General Staff [Lt. Gen. B.M. Kaul], his Deputy, the DMO, DMI, and other Staff Directors is inexcusable. From this stemmed the unpreparedness and the unbalance of forces. These appointments in General Staff are key appointments and officers were hand-picked by General Kaul to fill them. There was therefore no question of any clash of personalities. General Staff appointments are stepping stones to high command and correspondingly carry heavy responsibility. When, however, these appointments are looked upon as adjuncts to a successful career and [if] the responsibility is not taken seriously, the results, as is only too clear, are disastrous. This should never be allowed to be repeated and the staff as of old must be made to bear the consequences for their lapses and mistakes. Comparatively the mistakes and lapses of the staff sitting in Delhi without the stress and strain of the battle are more heinous than the errors made by commanders in the field of the battle. 12- The unmilitary poise of our forces in Ladakh has already been too clearly brought out and needs no further elaboration. I am republishing here an article posted 2 years ago on this blog. After the 'release' of the Henderson-Brooks-Bhagat Report, one should not forget that there are many more hidden reports in the almirahs of the South Block (both MEA and MoD). As the 50th anniversary of the debacle of 1962 approaches, it is necessary to have a fresh look into some of the events which led to the Himalayan Blunder. The Sino-Indian conflict is usually associated with the Henderson-Brooks Report (HBR) prepared in 1963 by Lt. Gen. Henderson-Brooks and Brig. Prem Bhagat. Today, this file is the most secret of the Indian Republic. Pradhan says that he is the only person alive who had examined the report (Neville Maxell, the author of India’s China War probably saw portions of it). Does it mean that the Himmatsinghji Committee Report is lost forever? The ministry’s babus will probably sit on this order till their retirement and the CIC will forget about it; the Himmatsinghji Report will never be available to the Indian Public. In any case most babus believe that military and strategic affairs are not the business of ‘common men’. Why is the Himmatsinghji Committee’s report important? Intelligence Chief, B.N. Mullik wrote in his memoirs that the decision to form a Committee followed a note ‘New Problems of Internal Security’ sent by the Intelligence Bureau (IB) in November 1950 …as well as the letter of Sardar Patel to Nehru on Tibet. On December 1, a Committee was formed with Major-General Himmatsinghji, Deputy Minister of Defence as a Chairman. This Committee would have suggested that in the sectors where the boundary was undefined, India should decide its claims. Having decided on its claim line, effective steps should be taken to prevent unilateral occupation of these areas by Chinese or Tibetans. It is probably this ‘smaller’ Committee which decided to immediately march towards Tawang. The Committee also recommended the reorganization of the administrative divisions of NEFA, the opening of new districts, and increase in the staff manning new posts, the extension of these administrative centres further towards the McMahon Line and the formation of a Frontier Service cadre for service in the frontier areas. An important increase of the Assam Rifles and the Civil Armed Police at strategic points was also sanctioned. The Committee suggested the construction of new roads and the improvement of existing ones to link the Assam Rifles posts with headquarters (it was in 1951!). At that time, the entire area down to Dirang (south of the Sela Pass in Tawang district) was still under some vague Tibetan administration, with a Tibetan Dzongpon (district commissioner) still collecting 'monastic' taxes from time to time in and around Tawang. It is then that Major Bob Khathing, a Manipuri officer who served in the Assam Rifles, entered the stage. In January 1951, just as he had been posted as an Assistant Political Officer (APO) in Bomdila, Khathing was summoned by the Assam Governor, Jairamdas Daulatram who asked him to go and administer Tawang. On 17 January 1951, Khathing, accompanied by 200 troops, left for Tawang, south of the McMahon Line. The party was later joined by a 600-strong team of porters. The Assam Rifles of Bob Khathing reached Tawang on February 7. Was it Bajpai's last homage to Sardar Patel who had passed away on December 15 and who had understood the importance of integrating all territories belonging to the Union of India? As he arrived in Tawang, Khathing was warmly welcomed by representatives of the Tawang monastery, the local headmen and leaders. The Himmatsinghji Committee probably realized the light touch had to be balanced by military presence. Some rumours have recently circulated that Nehru did not know about the Tawang operation; this would truly mean a serious lapse as the Assam Rifles worked directly under the Ministry of External Affairs and Nehru was then the Minister. A 'military' operation of this scale certainly could not be decided locally and needed the approval and funding from the Central Government. Did Patel and Bajpai decide the operation on their own and order Jairamdas Daulatram accordingly? It is impossible to answer this question unless the related files are found. This article is dedicated to all those who died during the 1962 Sino-Indian war; to those who suffered for months in the PoW camps in Tibet; to those who were humiliated for no fault of theirs; to their families. Let us hope that what happened in 1962 will never happened again. My conclusion was that one of the reasons for the famous report, written by the Anglo-Indian General Henderson Brooks, not to be released by the Government of India, was that in the early months of 1962, the Army Headquarters had some doubts about where the frontier with Tibet was. Under political pressure, they nevertheless foolishly went ahead and established a post at Dhola near the disputed Thagla ridge. It was the perfect excuse for the People’s Liberation Army to go to war against an unprepared India. “The McMahon Line from just north of Khinzemane, as drawn by Sir Henry McMahon in 1914 with a thick blue pencil on an unsurveyed map, was not an accurate projection of the Himalayan watershed line. Much of the territory in those days had not been explored and McMahon was only guessing at geography when he drew a thick blue [red] line from Khinzemane to the Bhutan-Tibet-India tri-junction to its east. In this process the position of Thagla Ridge was, to say the least, left ambiguous. Though the Thagla Ridge was the logical border if one followed the watershed principle as well as the ownership of customary pastures’ rights, the fact remains that the old map which was the reference for India’s position on the ‘genuine’ location of the border, showed the Thagla Ridge and the Namkha Chu, North of the 1914 McMahon Line. It could explain how Mao was aware of Operation Leghorn to evict the Chinese from the Thagla Ridge (north of the Dhola post) in October 1962. This explains that the Government of India was not keen to show that the 4 Corps Commander (earlier Chief of General Staff in the army Headquarters), Lt. General BM Kaul, a special appointee (and protégé) of Prime Minister Nehru, was not only unsure where the frontier with Tibet was, but took the risk to set up a post in a place which could be north of the border. The Prime Minister was too busy solving the problems of the world to look into these ‘small’ details. But it was enough for China to have a pretext to attack India a few months later (October 20, 1962). The rest is (sad) history. Today, we know the guilty men of 1962. It is a step forward for the nation. Excerpts from the Henderson-Brooks-Bhagat Report released by Neville Maxwell, author of India’s China War. 22- As the Dhola Post was the focus of the start of the Sino-Indian hostilities in NEFA, it is important that the background to the establishment of the Dhola Post is given in some detail. “No patrolling except defensive patrolling is to be permitted within two to three miles of the McMahon Line. In case a post has been established within two miles of the McMahon Line, in accordance with paragraph 2 above, then defensive patrolling is permissible in the vicinity of this post”. Para 2 if the letter laid down that, under certain conditions, post could be established NOT more than 2 miles as the crow flies from the McMahon Line. (Headquarters Eastern Command letter No. 120901/20/A/GS(O) of 9 June 1960 – Annexure 40). 24- The Chinese in June 1961 had, it appeared, patrolled across the McMahon Line some 3 – 4 miles West of Khinzamane [also written Khenzimane] and had shown interest in the area. Thus, in March 1962, with the approaching of the patrolling seasons, Eastern Command, on the subject from XXXIII Corps, asked Army Headquarters for permission to patrol the area of the McMahon Line West of Khinzamane. 25- On 27 April 1962, Army Headquarters gave their permission for patrolling as well as establishing news posts upto the McMahon Line, without prior sanction (Army Headquarters letter NO. 67045/GS/MO1 of 27 April 19562 – Annexure 41). 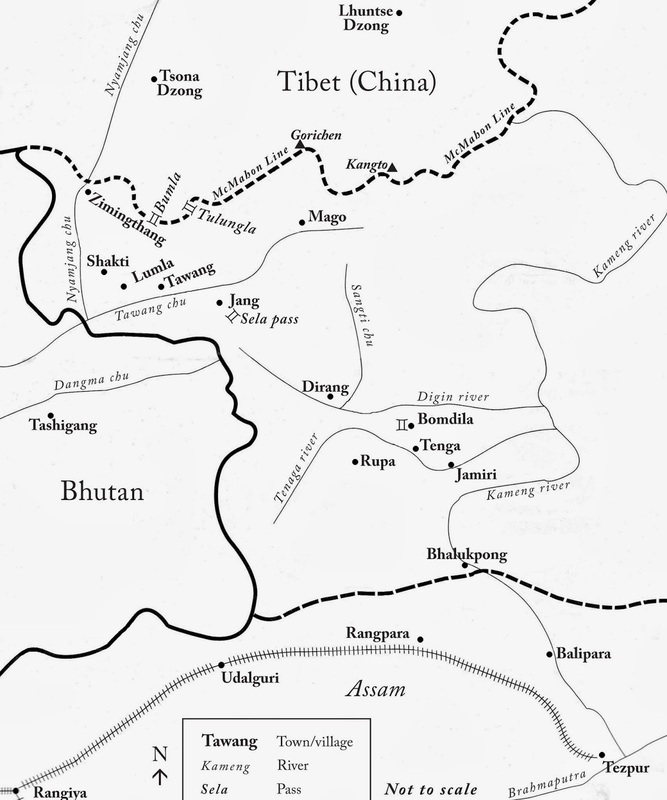 26- Originally, the intention of the establishing a post West of Khinzamane was to establish one at the Bhutan-India-Tibet Tri Junction, as given in the maps existing in May 1962. (Refer Para 15 above). These maps showed the Tri Junction at MM 7914. 27- The border in the map did not run along the watershed but was an arbitrary one running due West from Khinzamane. The watershed line and the old line are given in sketch. The watershed Tri junction is some four miles north of the one given in the maps then existing. 28- The post for various reasons was not established at the old Tri Junction, but Dhola MM 8316. Capt Mahabir Prasad of 1 Sikh selected and established the Dhola Post with a strength of one platoon of Assam Rifles on 4 June 1962. 29- In August 1962, XXXIII Corps brought to the notice of the Eastern Command the discrepancy between the arbitrary line drawn on the map and the line as it should be according to the watershed principle. (Annexure 42). This letter is important, as it gave the details of the two boundary lines. The main points are given below: (For the location of various features see Sketch H). a- The boundary line printed on the maps had considerable inaccuracies, if the watershed principles and usage were to be applied. b- According to local inhabitants (grazers) and the political representatives who accompanied the Assam Rifles to the Dhola Post, the accepted/recognized boundary was the one based in the watershed principle. (The letter did not specify as to who accepted/recognized the boundary line). It was however, common knowledge that the McMahon Line was based on the watershed principle. The Tri-junction, according to the watershed principle, should be MM 7522 and not as shown on the map MM 7914. (iv) XXXIII Corps recommended that one post should be established at Thagla and another at the Tsangle MM 7719 to cover the other two passes. Tsangle, as can be seen, according to the old boundary, was in Bhutan. (Bhutan, incidentally did raise this question in October, when a representative of their approached Corps Headquarters). (e) The letter went on to give recommendations for establishing these posts and also asked for a survey to be carried out. Pending approval o the recommendations, it was intended to carry out patrolling between Khinzamane and the Watershed Tri-junction. This, in effect, meant that the post was actually NORTH of the McMahon Line as the marked on the map. The location as given out MM 8513 was just SOUTH and MM 8816 just NORTH of the Line. (Though the sketch showed this, the letter was not clear, and it was never really expressly brought out till 12 September 1962). 30- Eastern Command conveyed the contents of this letter to Army Headquarters on 31 August, 1962. 31- An incident of some interest to the above recommendations had occurred in the meantime and requires note. A Subsidiary Intelligence Bureau representative, on a reconnaissance of the area of Thagla Ridge had found a wooden plank on 23 May 1962 with Chinese characters. These were later translated at Tezpur and read “This is our river and mountain”. This was conveyed to 4 Infantry Division by XXXIII Corps, Eastern Command and Army Headquarters on 12 July 1962. (Annexure 43). This then was another pointer that Namka Chu and the Thagla Ridge were sensitive areas. 32- On September 1962, as is well known, Dhola Post was surrounded by the Chinese, who, by the evening, were reported to be some 600 strong in the area. The Henderson-Brooks Report is out! The Henderson-Brooks/Bhagat Report of the 1962 is out! Neville Maxwell, the author of India's China War has posted the famous Report on his website. I marked the new century by publishing as an “Introduction to the Henderson Brooks Report” a detailed description, and account of the circumstances in which it was written, explaining its political and military context and summarising its findings (EPW,April 14, 2001): there was no public reaction in the Indian press or even among the chauvinist ranks of the academic security establishment. My first attempt to put the Report itself on the public record was indirect and low-key: after I retired from the University I donated my copy to Oxford’s Bodleian Library, where, I thought, it could be studied in a setting of scholarly calm. The Library initially welcomed it as a valuable contribution in that “grey area” between actions and printed books, in which I had given them material previously. But after some months the librarian to whom I had entrusted it warned me that, under a new regulation, before the Report was put on to the shelves and opened to the public it would have to be cleared by the British government with the government which might be adversely interested! Shocked by that admission of a secret process of censorship to which the Bodleian had supinely acceded I protested to the head Librarian, then an American, but received no response. Fortunately I was able to retrieve my donation before the Indian High Commission in London was alerted in the Bodleian’s procedures and was perhaps given the Report. In 192, noting that all attempts in India to make the government release the Report had failed, I decided on a more direct approach and made the text available to the editors of three of India’s leading publications, asking that they observe the usual journalistic practice of keeping their source to themselves. (I thought that would be clear enough to those who had long studied the border dispute and saw no need to depart from my long-standing “no comment” position) To my surprise the editors concerned decided, unanimously, not to publish. They explained that, while “there is no question that the report should be made public”, if it were leaked rather than released officially the result would be a hubbub over national security, with most attention focused on the leak itself, and little or no productive analysis of the text. The opposition parties would savage the government for laxity in allowing the Report to get out, the government would turn in rage upon those who had published it. The downloadable report is available on the website of The Indian Defence Review. While the Indian press says that AK Antony has been the worst ever Indian Defence Minister (read India Today's article) and the Minister himself says he has done so much for Indian defense preparedness, China is laying railway lines in Tibet at a frantic pace. The latest section to be started in September will link Nyingchi (or Nyingtri in Tibetan), north of the McMahon Line to Lhasa (and the mainland). China Tibet Online yesterday reported 'Lhasa-Nyingchi Railway to be launched within the year'. According to another website, ChinaTibetnews.com: "Lhasa-Nyingchi Railway is expected to start construction within 2014 soon after the completion of Lhasa-Shigatse Railway construction that is scheduled in September." For the first time, details are given about the strategic line: "Running 433 kilometers and covering 34 stations including nine major ones, Lhasa-Nyingchi Railway will build 402-kilometer new lines, which is designed to have a speed of 160 kilometer per hour with a declared investment of 5.4 billion US dollars." Yang Yulin, a deputy director of railway office of Tibet explained that the Lhasa-Nyingchi Railway will start from the Shelrong Station on the Lhasa-Shigatse Railway (to be completed in September); it will then cross the Yarlung Tsangpo River (Brahmaputra) and heads towards the Lhoka Prefecture to finally arrive in Nyingchi. The article admits that today, the communication and traffic with Nyingchi and the Lhoka Prefecture depends only the highway and an airport, near Bayi town (the main PLA cantonment in Southern Tibet) in Nyingchi Prefecture. China Tibet Online asserts that this line of communication suffers from a number of disruptions as "special weather conditions may break down the land and air routes occasionally". More interestingly, it adds: "the abundant natural resources also call for a stronger transportation support of the area." 'The abundant natural resources' probably refers to the rich mineral resources of Tibet which are wildly exploited, but also to the power generation potential of the Great Bend of the Yarlung Tsangpo/Brahmaputra. See my article on the diversion of the river. It means that everything is slowly coming into place to make the mega project feasible. The rest of the article is more obscure. It says: "Furthermore, a world-class landscape gallery would be formed after the construction of Lhasa-Nyingchi Railway, which will connect not only the tourism resources along the line, but also famous scenic areas such as Jiuzhaigou Valley [Valley of Nine Villages, a nature reserve in northern Sichuan], Yellow Dragon Scenic Area [Huanglong, a scenic area of and historic interest in northwest Sichuan], the Qinghai Lake [Kokonor lake], as well as tourist cities including Chengdu, Dali and Lijiang [both Yunnan], through a railway network covering Chengdu-Nyingchi Railway, Yunnan-Tibet Railway, Qinghai-Tibet Railway and Lhasa-Shigatse Railway." It probably signifies that China is planning to complete the loop, Xining-Lhasa-Shigatse-Nyingchi-Chengdu-Kunming, to promote tourism and harness Tibet's rich natural resources. "Dense forest, extensive grassland, clean water, blue sky and clear air are not only Tibet's largest wealth, but also the biggest contribution Tibet has provided to China and even to all mankind", thus speaks Lobsang Gyaltsen, Chairman of the Tibet Autonomous Region (TAR) and a deputy to the National People's Congress (NPC), which was recently held in Beijing. Lobsang Gyaltsen further stresses that Tibet is for China, an important ecological safety barrier; he called Tibet, the 'Asian water-tower', the 'last pure land of the world' in view of its important ecological and strategic position. In Gyaltsen's mind, 'strategic' is probably due to the fact that 11 of the major Asian rivers have their sources on the Tibetan plateau. Lobsang Gyaltsen continues: "Feasible measures should be taken to protect the environment of Tibet. At present, Tibet remains as one of the best areas in ecological environment in the world." He adds that his government has always attached a great importance to environment protection, 'sticking to the bottom line of environment protection'; he swears that the TAR "has never introduced enterprises and projects with high energy consumption, high pollution and high emissions." That sounds good, unfortunately, the Fifth Work Forum on Tibet in 2010 decided to transform Tibet into an important international tourism destination. When Lobsang Gyaltsen says that Tibet should upgrade its tourism industry, build high-end tourism scenes and create high-quality tourism products to promote the integrative development of tourism, culture and ecology, he is really serious? First, why should 'Tibet tourism' be a 'product' to sell? Once you call it a 'product', it comes under the law of the 'market', who care a less for environment as most of the large cities in China has recently been experiencing. Gyalsten forgets that to feed and take care of 15 millions tourists on a Roof of the World every year, a lot of energy, water, food is required. All this means more pollution. Gyaltsen also asserts that it will soon will be faster (and more convenient) to reach several places on the plateau. He mentions the Lhasa-Shigatse Railway, which connects Lhasa to the second largest Tibetan town; it will be opened in September as well as the soon-to-be started railway line connecting Lhasa and Nyingchi, near the Indian border of Arunachal. He speaks of 'a comprehensive transport network of highways, railways, airlines and pipelines'. He concludes: "We will never develop economy at the cost of environment." For Tibet's Communist boss, the region is a great attraction "for its unmatched natural landscapes, such as the Mount Chomolungma [Everest] and Yarlung Tsangpo [Brahmaputra] Grand Canyon, and local customs and practices in the world, such as Tibetan songs and dances." Gyaltsen probably sees the huge revenues pouring into the coffers of his government, but has he ever looked at the collaterals of bringing 15 million visitors on the Roof of the World? Legislators from Tibet at the National People's Congress also vowed to protect the local environment; they even warned that ecological degradation may harm tourism. It is in fact the opposite; mass tourism can only harm environment. 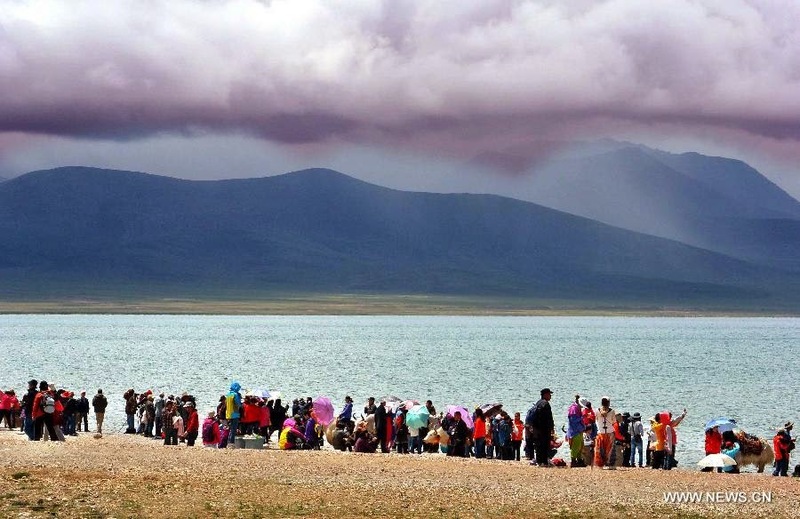 Hong Wei, a Tibetan (from Ngari) with a Chinese name, who is deputy head of the regional tourism bureau told China Tibet Online: "Tibet is protecting its environment with a no-nonsense manner; we will never develop our economy at the cost of the environment". Kelsang Choekar, another deputy to the NPC told the press in Beijing during the NPC: "Tibet's goal is to be a world class tourist destination. We are still far from that. If the environment in Tibet is damaged, its attraction will be greatly harmed." Do these deputies really believe what they say, or are they saying what they are told to say? There is no doubt that mass tourism is the best (and the quickest) way to destroy the environment as it demands large amounts of energy and generates huge quantity of solid waste. 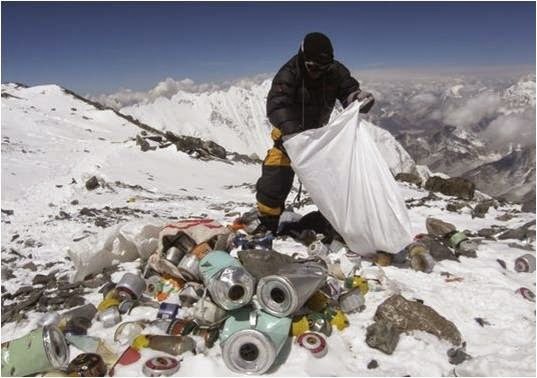 The only 'feasible measures to protect the environment of Tibet' is to limit the numbers of yearly visitors. The same is valid for the entire Himalayan belt. My article Referendum in Crimea grabs China by the throat appeared in NitiCentral. Chinese President Xi Jinping, also chairman of the Central Military Commission, told the plenary session of 12th National People's Congress on March 11: "We expect peace, but we shall never give up efforts to maintain our legitimate rights, nor shall we compromise our core interests, no matter when or in what circumstances." That sounds simple, but unfortunately for Mr. Xi, ‘interests’ are no longer black and white like in Mao’s days. The issue of Ukraine/Crimea is a case in point. At the end of February, Western capitals were terribly outraged (or feigned to be outraged), when Russian troops started ‘exercises’ in the Crimean Peninsula of Ukraine; before Moscow instigated a referendum to decide whether Crimea would join its destiny with Russia, Beijing was in a dilemma. Russia is China’s close friend and ally; President Xi even attended the opening of the Winter Olympics at Sochi to be seen with his Russian counterpart. History has never been black and white; in the age of globalization, it is even more so today. In January 1954, the Soviet leader Nikita Khrushchev, born in Russia near the Ukrainian border (and married to a Ukrainian), agreed to transfer Crimea to Russia. The Soviet leader who had served as Party Secretary in Ukraine knew that, by becoming part of the Ukrainian Socialist Republic, Crimean region would economically benefit from the hydro-electric potential of the Dnieper river. He did not foresee the forthcoming collapse of the Soviet Union, which then enjoyed two major ports on the Black Sea (Sevastopol and Odessa); they were strategically located for the defence of the then Soviet Union (and later Russia). Remember that in 2010, the deposed Ukrainian President Viktor Yanukovich signed an agreement with Russia extending the lease of the Sevastopol for use by Russia's Black Sea Fleet from 2017 to 2042, with the option of further extension till 2047. This was obviously not a good development for Washington and the Western capitals which probably dreamt of a ‘Europe from Atlantic to Ural’ as enunciated by General Charles de Gaulle in the early1960s. One of the 3 ships sold by Ukraine to China in the 1990s, was the aircraft carrier Varyag, today rebuilt as the Liaoning, China's first aircraft carrier which made recently the headlines. In April 2010, the press agency Interfax reported the signature of a contract with China to build high-speed hovercrafts, of the Zubr-type, at the Morye shipyard in Feodosia. A $350 million contract for the construction of four high-speed amphibious hovercrafts was concluded by Ukrainian arms trader Ukrspetsexport in 2009; two were to be built in Ukraine and two in China with Ukrainian ‘participation’. At the time of a crisis, like we are witnessing today, this is terribly complicating the situation for the Mandarins in Beijing. It is even more entangled! 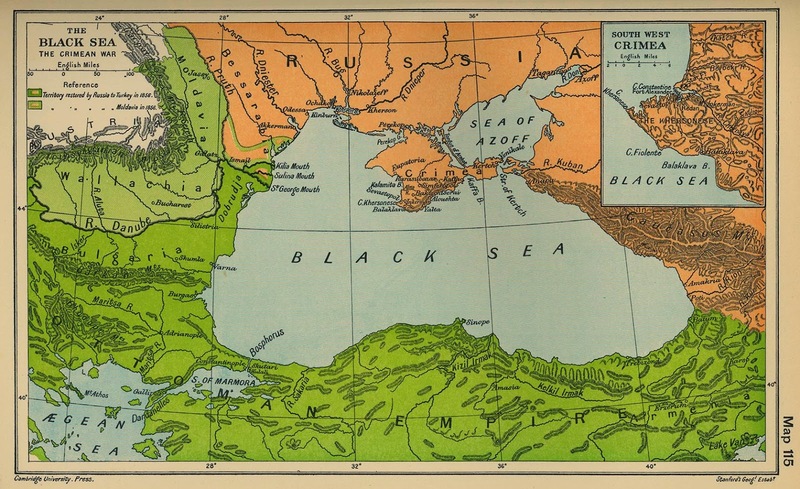 In an Op-ed in The South China Morning Post, Paul Letters explains that Crimea's planned referendum has put Beijing in a quandary, whatever the result, and raised fears about the idea spreading in the Middle Kingdom; Letters analyses: “Russia has taken us back to imperialism by occupying a neighbouring country, but is Moscow's support for a vote for Crimeans to determine their own destiny such a terrible idea? It is if you're the government of China.” Why? In the West, a referendum is used when it is convenient; today it is being denounced; some of the Western media even alluded at Hitler's using referenda to ratify the grabbing of new territories by the Reich. But it has extensively been used in the past; remember the French voted against the entry in the EU and had to revote ‘yes’ a few years later. For China, it is worse as a referendum could mean ‘splitting’ the Motherland. If a country like Spain is against a vote to decide the future of the Catalan and Basque countries (Madrid is even against Scotland's entry into the EU fearing that it would encourage the Basques and the Catalans to secede), in China it would mean that Tibet, Xinjiang or Inner Mongolia could rightly ask for a referendum for ‘self-determination’. Since the beginning of the Ukrainian crisis, Beijing has been walking on eggs. China's foreign ministry spokesman Qin Gang cleverly avoided to directly answer, he just said: "China has always upheld the principles of diplomacy and the fundamental norms of international relations". Paul Letters said: “You could feel the Politburo squirming in their seats”. A referendum is the last thing Beijing would like to happen, even if their State is known as the People’s Republic of China (and their Parliament, the National People’s Congress); the less ‘People’ put their nose (or give their opinion) in the State’s affairs, the better it is for the Party’s rule. Let not even talk about the so-called minorities such as the Uyghurs or the Tibetans. Nobody wants to know their opinions. Indeed, life is complicated for the apparatchiks in Beijing. It was easier a few decades ago, there was the Good (Communist China), the Bad (America and its ‘lackeys’) and sometimes the Ugly (the Soviet Revisionists). Today, everything is mixed up and it is difficult to untangle ideological, business and other core interests. Whether it is possible is another question. Even if China decides to only lean softly on the Russian side, one could ask, what about India? Nobody probably has time to think of these issues in South Block, elections are coming! The Year of the Wood-Horse or the Steel-Car?